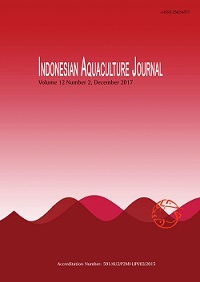 Indonesian Aquaculture Journal (IAJ) (http://ejournal-balitbang.kkp.go.id/index.php/iaj) is published in both printed (p-ISSN 0215-0883) and electronic (e-ISSN 2502-6577) versions. Currently, IAJ is listed as Category 2 Accredited Journal in the Decree of the Ministry of Research, Technology, and Higher Education of Republic of Indonesia (RISTEKDIKTI) No. : 21/E/KPT/2018, Date July 9, 2018. The accreditation is valid for five years from Volume 11 Number 1, 2016 to Volume 15 Number 2, 2020. This journal is published twice a year (June and December issues) with the first IAJ edition published in 2006. Indonesian Aquaculture Journal is a peer-reviewed and open access journal based in Indonesia that globally/internationally accepts and publishes scientific articles in the field of aquaculture. The journal is hosted and managed by the Research Center for Fisheries, Indonesian Ministry of Marine Affairs and Fisheries and serving as a scientific platform to share research information in and contribute to the development of various disciplines of aquaculture including genetics, reproduction, nutrition and feed, fish health and diseases, engineering, and environmental assessment. Only manuscripts with research contents that are in line with the focus and scope of the Indonesian Aquaculture Journal will be selected for further reviews. All selected manuscripts are then verified by the journal’s editors for writing format based on the journal guidelines and checked for potential plagiarism using plagiarism detection software (Plag Scan, Turnitin and Google Scholar). To comply with the Indonesian Aquaculture Journal standard on plagiarism, the authors have to include the signed Authorship Statement when submitting the manuscript (the form can be downloaded here). Only after satisfying the writing format requirements and passing plagiarism checks, the Editor in Chief will assign a manuscript to one of the members of the Editorial Board to determine if the manuscript is accepted for publication. A regular (semester) editorial board meeting is held to formally accept or reject manuscripts. The rejected manuscripts will be returned to the authors. The accepted manuscripts will be sent to reviewers following a double-blind peer-review policy. The reviewed manuscripts are sent back to the authors for the necessary revision. The revised manuscripts from the authors will be rechecked for plagiarism to maintain high publication quality post-revision process. The journal’s editors will carry out a final proofreading in consultation with the authors to improve the readability of the revised manuscripts for final publication. All review and publication processes within the Indonesian Aquaculture Journal are through the journal online system.